Former government Minister Devant Maharaj clashes with an officer from the Guard and Emergency Branch outside Tower D of Parliament at the International Waterfront in Port of Spain yesterday, as officers attempted to prevent protestors from gathering outside the chamber entrance. Several people who had gathered to protest outside the Parliament Tower at the International Waterfront Centre in Port of Spain yesterday cheered Opposition MPs and jeered Government MPs who were making their way into the building for continuation of the budget debate. The demonstrators packed the streets of Wrightson road outside tower D of the International waterfront yesterday to express their discontent over various issues introduced during the reading of the Budget on Monday. Opposition Leader Kamla Persad Bissessar was met with uproarious applause as she and other Opposition MPs entered the chamber. 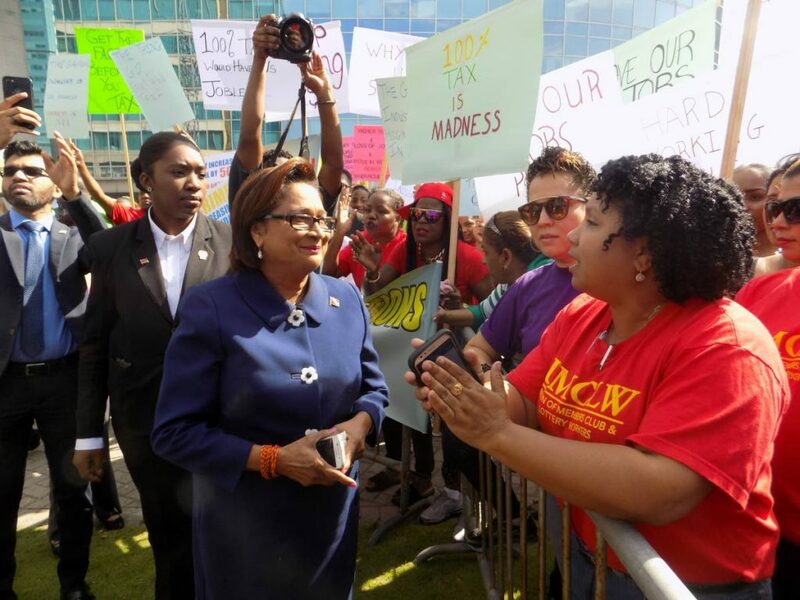 Persad-Bissessar spoke with protesters and assured them that their concerns would be highlighted during yesterday’s debate. Opposition Leader Kamla Persad Bissessar speaks to members of the Union of Members Clubs and Lottery Workers (UMCLW) outside parliament. However, several government ministers were not spared the brunt of the crowd’s feelings. Laventille West MP Fitzgerald Hinds was greeted with loud jeers as he arrived. He smiled as he walked into the tower entrance. 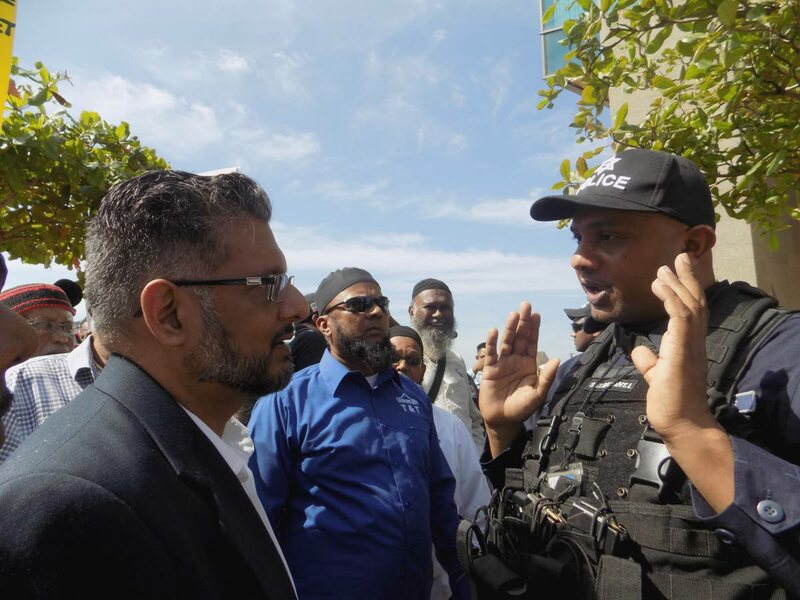 Shortly before, there was a brief confrontation between police and demonstrators led by former government minister Devant Maharaj when they tried to assemble in front of the Parliament tower but were barred by officers of the Guard and Emergency Branch (GEB). The protesters’ path was blocked by the police with Maharaj later describing the act of law enforcement as, “An act of desperation”, by government. “This is a clear case of government trying to stifle democracy. When we (the People’s Partnership) was in government there were all kinds of protests and we did not make any attempt to stop it. So why are they trying to block us right now,” an angry Maharaj asked. Before long however, officers gave way to the protesters who were warned to remain behind barricades placed at the Parliament tower. They were also warned to maintain law and order. Assistant Police Commissioner Radcliffe Boxhill who led the police operation, said that the protesters were free to express their opinions and protest once they were not obstructing the free passage of pedestrians and motorists along Wrightson Road. Reply to "Cheers, jeers for Ministers"